By Maor Hoyman – Writer for TheMarker (article published August 17th, 2017 and translated from Hebrew to English). The Venus Project supporters envision a world of abundance where automation eliminates almost all jobs and all citizen’s needs are free. You can call them dreamers or socialists, but you should also listen to their critique of the existing economic system. 90 years have passed since the mad scientist Rotwang from the futuristic film Metropolis invented a robot to replace a human being, and all the people of the city rebelled against him and killed him, but today too many seem to share the great concern expressed by the director and screenwriter Fritz Lang in that film. True, no one gets up in the morning in fear of being dismissed and replaced by a robot. But are we too complacent? After all, this process is already here. Perhaps rather than fearing a future without work, we should welcome the changes it will bring. According to The Venus Project, a social organization which is calling for a reexamination of the social systems and updating them according to the knowledge accumulated since their establishment. “We are working today with economic and social systems that are more than 200 years old – like capitalism, democracy and British law, but in these 200 years human knowledge has multiplied dozens of times, and these systems have barely been updated,” explains Jonathan Gan-Mor, the organization’s speaker in Israel. What is a Resource-Based Economy (RBE)? “This is an economic system that represents a conceptual shift from a situation in which we think we are building things through money, to a situation where we understand that in order to build and manufacture anything – resources and technological knowledge are needed. If I have wood, tools and know-how, I can build a table without money, but if I’m on the moon, and I have no resources, but I have a suitcase with a million dollars – I can not build a table”. Fresco spread his ideas through films, books and lectures, and also set up models for the futuristic city he envisioned at the Venus Project Center he built in Florida. “In the 1980’s, ten buildings were built there on relatively cheap land,” says Gan Mor. “In Florida they have models of residential buildings, transportation and agriculture in the future city. They took a remote and empty area and turned it into a beautiful jungle, built everything with a very low budget, without professionals. Tours are held once a week in Venus, Florida. Fresco did the tours himself until he passed away last May, at the age of 101”. How did it get to Israel? “In 2008, following the financial crisis, many protest movements were established around the world, and then the project received a lot of exposure. After we started promoting the project in Israel, we held talks with Fresco in Skype. The protest of summer 2011 (the biggest social protest in Israel’s history) gave us a serious boost. The core volunteers of the Israeli team have worked very hard since then to bring the project to as many ears as possible. “Right now we are at the stage of introducing our ideas to the public discourse. We give lectures in High Schools, Young leadership schools, youth movements and educational seminars as well. We manufacture and distribute video content and lectures. We also translate materials to make them more accessible to the Israeli public. We had seminars of more than 20 sessions in which we got into the thick of things”. Gan Mor, 31, holds a B.A. in economics from Tel Aviv University, and before joining the Israeli team of the project he worked for a number of companies dealing with bonds, currency and commodities. “I managed investment portfolios by the millions, followed stocks and read economic newspapers on a daily basis for many years”, he says, “and found no basis for the assumption regarding to scarcity on which the whole modern global economy is based, the assumption that ‘human desires are endless, while the world’s resources are limited’. This hypothesis, he states, doesn’t reflect the current economic reality: “Until the Industrial Revolution, the main problem of the economy was how to produce more. There was an authentic scarcity (unlike artificial scarcity), because all production was based on manual labor. But since then the means of production have changed enormously. From a situation where almost everyone is engaged in agriculture, we have moved to a situation in which almost nobody is engaged in agriculture – and we still have more food than ever. “We need another operating system. In Thailand, for example, there is a manual laundry service that operate by manual washers. If the owner of the laundromat bought a washing machine, he would fire the washers. But what happened in the 1950’s when we started having washing machines in our houses? We were not hurt. On the contrary, if I have a washing machine, I work less hard at home. The Venus Project offers an economic system more like the one we use at home. Instead of firing all the washers because of the new machine – they will simply work less”. Why should people work in the future? The Venus project is not afraid of automation in the labor market. “Automation will replace all technical work, and then people will have more leisure, and there will be free music centers, free cultural centers, free sports centers, a free university” says Gan-Mor, and recalls the existing model of a public library: “Just as a book can be borrowed in the library, read and returned, in the same way we will use access centers where products and services will be made available to the public. In such a method you have ten times more items available without producing even one more”. These ideas may sound utopian, even naive, but Gan-Mor emphasizes they are backed by a well-planned and achievable plan. “The changes we propose are intellectual first (changing the way we think), and those changes have to be made as a society,” he says. “We propose to start with a small research center – a city of about 30,000 residents, which will examine automatic production systems and services to the public, such as public transportation systems, etc. It will be possible to invite leaders from around the world to come and be exposed to the ideas and perhaps establish such cities in their own countries – and it will spread from there”. Why not turn to people who have the means to start such a system? How will humanity progress without an economic incentive? Most inventions weren’t invented for money. Albert Einstein didn’t invent the relativity theory to make money. The Wright Brothers didn’t invent the plane to make money. Martin Luther King, Mahatma Gandhi, the feminist movement, the LGBT movement – All of these people have promoted their ideas without looking at the bottom line. In our society, prime ministers and ministers of economy and finance are dealing with the question of ‘How do we create jobs?’ The question should be: ‘How do we produce products and distribute them effectively?’ Jobs were means to reach a certain goal in the past, before automation. We need to renew our thinking about all these concepts due to all the new information, and the new possibilities that have opened up to us in the modern era”. Hi there, in general I like the idea/the vision of the Venus-Project very much. For me personal I don’t agree in one point of your essay “Why not turn to people who have the means to start such a system?”. My opinion, is it not that the people have not sympathies for the idea. The point is, that many questions about this changement are not answered clear. Normally every changement leads to winner and losers. Isn’t it the core challenge, that the people are insecure, what this huge changement will leads into? I like, that your arguments shows the benefits. We all know, there is nothing, who has only benefits, agree? Maybe it would be worth, to take the insecure and show what it would lead to everyone. For example in your lines “How will humanity progress without an economic incentive?”. The writer may be right with the given examples of Albert Einstein etc.. , is it pathos and to easy. Where is a real plan, like a masterplan with detailled figures and arguments who shows, how it can work out for ALL people and not only for a few? My impression, as long as no detailled informations, like several realistic plans/options, is given, it will be a vision. And is it not this exactly the point, why people have sympathies for your idea, but don’t engage much for this wonderful idea? In a world,this is what it looks like when money sometimes can be a real situation esp. the great depression.I’m Olumide Babajide Adeniyi and I also studied mechanical [email protected] university okada,Edo State,Nigeria, Africa from 100-200 level when I spent 2 years from 2011-2013 but due to the unseriousness that I had,I’ve got no idea on how to change course to another like medicine and I went to visit the medical school college but dropped off before transferring to another school novena university ogume,amai,Delta State,Nigeria, Africa where I studied economics from 200-400(final year) which I spent 3 years from 2013-2016 and I graduated with a pass honours. This is what I found out that The Venus Project is a scientific organization that proposes an alternative vision of what the future can be if one applies in achieving a new sustainable civilization involving a social and economic system intended to run off a resource based economy(i.e without money or any kind). I Love Mr Jacque Fresco my best scientist whose innovation became a society as an economist, futurist, architect, lecturer,artist, multi disciplinarian, cinematographer, industrial designer and social engineer because he is more invincible and better than Albert Einstein, Charles Darwin, Karl Marx,Buckminster Fuller and Thorstein Veblen. 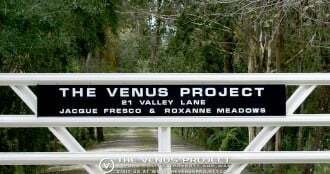 Also my regards to a cofounder Mrs Roxanne Meadows due to the fact that Mrs Meadows had a study under The Founder of The Venus Project Mr Jacque Fresco.May God bless this project as a way of understanding of the future. you know, like caring for each other and treating everyone as having as much right to life as everyone else (including animals) How are Israeli’s going to cope without violence or money one may wonder. The idea of building walls and engaging in genocide will be old hat in such a world, but that’s what Israeli’s have relied on all these decades – how the heck will you all live without those crutches? Denise Ward, what is the matter with you? Ah yes, you think Israelis engage in genocide and thrive on violence! Only an uneducated hater would write something like this. Israelis live for peace, but unfortunately the fake palestinians, who construct lies about fake genocide, don’t want them to have peace, so Israel is forced to protect herself! Not only are Israelis a warm and caring society, they care about the world and are among the first responders to natural disasters all across the globe. And let’s not forget all of the innovative ideas and creations in the fields of medicine, technology and agriculture that they share with the world to make it a better place. Jacques Fresco’s resource based economy will work very well in Israel and in the rest of the world. Sharon Fried, your response to Denise Ward’s question sounds defensive. Please step back and reflect on how Israel’s historical and current actions and policies toward the Palestinian people are perceived by others throughout the world. If the Israeli people are so “warm and caring”, then surely they can cooperate with the Palestinian people to establish a way by which the two peoples can co-exist in Peace, on their adjacent lands. From the vantage point where most of us in the world are viewing Palestine and Israel these days, it certainly appears that Israel has much greater monetary and military resources than does Palestine, and that those resources have been and are being used to oppress the Palestinian people. Denise Ward did not state that Israel does nothing good in the world; but much of the good that Israel does on other fronts, is cancelled in the eyes of much of the world, by how it treats the Palestinian people. Perhaps a place to begin again, would be for Israelis involved in TVP in Israel, to find a way to sincerely and respectfully offer their TVP info to interested Palestinians, and invite those same Palestinian people to form a dialogue group with the TVP Israelis. If the TVP Israelis are sincere and respectful in making this overture to interested Palestinians, then perhaps a shared, ongoing, open-ended dialogue together about TVP in their shared lands can lead to finding a mutually acceptable solution for how to get from the difficult present dynamics in Palestine/Israel, to the Peaceful Coexistence that TVP can help make possible. Such an accomplishment could then be a jumping-off point for many others grappling with difficult societal dynamics, to learn from, throughout that region and throughout the world. A resource based economy is as much about a better social system as anything else. Which improvements to our social systems aren’t you happy about? Our school teacher told us, grade seven students, about communism being the highest stage of human social development. He said that people will no longer have to work hard; the lion’s share of the work will be performed by intelligent machines. They will make all our necessary goods and grow enough food for everyone. For humans, this will free up a lot of time, and people may use it for self-improvement, for sports, for learning new sciences and crafts, for travelling and creating works of art. The motto of socialism is, “from each according to their ability, to each according to their contribution”, whereas in communism it is a little different,”from each according to their ability, to each according to their needs.” One student posed a question: “Well, what if everyone decides they need gold toilets?” The teacher smiled knowingly and said that when we reach the stage of communism, morals will be so high that no one will want a gold toilet or other unnecessary luxuries. This lesson about the sweet, selfless dreams of mankind took place as recently as 1950, just 65 years ago. We thought it would take thousands of years before sufficient infrastructure for communism was established, but technology was quicker than expected, and intelligent machines started appearing. Experts on artificial intelligence said it would take only another two or three decades for almost all work to be done by machines; 99 percent of jobs would disappear. Today it is rare to see a man with a pick and shovel, at least in developed countries. More and more workers just click on buttons. At first it seemed to me that Lenin’s prediction that, “those who are now 15 years old, will live under communism” was overly optimistic. I couldn’t imagine how machines would be able to handle certain professions, like that of medical doctor. We are accustomed to think of this not just as a profession, but also an art, and the thought that a machine would substitute a living doctor is just offensive. But let us still think about this a little more. What makes a person a doctor? Knowledge, a lot of knowledge. They study for seven years to accumulate only the basic knowledge of their medical speciality followed by a few years of residency to hone their craft. The steady stream of knowledge is becoming a roaring river. Now no one can keep up with it, even if they are a genius. So, doctors specialize: one specialist knows all about the left leg, and the other about the right. It is much easier to download knowledge into a computer’s memory than into a human’s. A doctor has to analyze disease symptoms to make a diagnosis, but a machine can analyze given information much easier and faster than humans to make a diagnosis. Recall the computer’s victory over the chess champion! People make mistakes very often; in fact “human error” is a common term. A doctor can forget or leave out some important detail, potentially harming a patient. Machines are also not immune to mistakes, but mistakes, judging from experience, will be very few. Now I can imagine that a machine could, and will successfully replace a doctor. Not immediately, but it will. Moreover, its services will not only be cheaper but will also be more available than a human’s. An artificial intelligence system enlisted to treat presidents could also serve a shepherd from a distant country, at the same high quality. But on the threshold of the era of abundance clearly seen a different kind of problems – moral, social, spiritual, call it what you want. Remember, in the beginning, we talked about the distant future when social development will allow us to willingly and consciously abandon unnecessary luxury? That’s the problem: although the material basis of communism almost created, but the morality of the vast majority of the population is still in the cave level. Want an example? There are Internet videos posted of the estates of famous and rich people. And then there just is not? Next to the house of the a very good and popular actor, are standing two aircrafts. One is not very big, just for a family. The second one – a huge Boeing. There is also a concrete runway, for the actor with the company could at any moment to take off and go, for example, in Rio de Janeiro. What’s the value of gold toilets compared with the requests of movie stars, it’s just a pocket change. Or the “lair” in Mezhyhiria belonged to Yanukovych, the President of Ukraine, who escaped from the people’s wrath in 2014. After he filled up several trucks with the most valuables of his estate and took them away, the video showed the remnants of his luxuries which forced me involuntarily squint from the glitter of gold and marble. I think the bandits, who grew up in poverty, so imagine the paradise which they built themselves when seized power. Economists attribute nowadays as dawn of the fourth industrial revolution. As is known, the first industrial revolution of 17-19 centuries began with the invention of the steam engine and meant the phasing out of manual labor. The second revolution occurred in the 20th century with the use of electricity and pipelined mode of production. At the end of the 20th century there was a tendency to create more effective and energy-efficient production with extensive use of computers, what is can be called the third industrial revolution. Finally, now started development of automaticly adjustable to human needs systems of production, a wide onset of robots and other machines equipped with artificial intelligence. It is said that the current stage it is logical to consider as the fourth industrial revolution. Recently in Davos gathered heads of the leading countries of the world to discuss and coordinate efforts for the harmonious development of the peoples of the planet, given the advance of this revolution. The fact that we all expect the liberation from slave labor, is wonderful, there are no words. But something in this perspective is clearly bad. Machines can do for us all things that we need, but the results of their work today belong exclusively the owners of those machines, and they are not going to share them with us for cheap. Only the rich can afford to buy expensive equipment. Moreover, so far, machines are replacing people which busy only on simple operations. In this regard, the workers, the people are not rich even while working lose their income completely. The gap between the rich and poor not only maintained, but is growing at an accelerating rate. Sermons and government’s promises of job creation are empty chatter. The number of jobs can only be reduced, because it is the goal of the creation of any new technology! That’s not the whole problem, accompanying the fourth revolution, but only a small part of it. If it only was about the greedy businessmen, perhaps it would possible to reason with them. Among them are many highly educated people who want to contribute to society. But about the layer of poor, make up the vast majority of the population, we can’t say so. What would be they engaged with after losing their jobs? Even if a decent standard of living would be provided for them, whether they will be engaged in self-improvement? Will they learn and create works of art? No, and we know it for sure. What will they do? What will happen to them (to us)? This is, in my opinion, is the main problem related to technical and material progress. The decisions nobody knows. Not many even anticipate the problem at all. O lucro a qualquer custo, está a degradar o planeta e a humanidade até à própria extinção. Tem que se acordar, tem de se mudar de sistema, há que se mudar de paradigma social e existencial.Agora o problema :quem é que começa? Os ricos querem continuar com os seus lucros e a sua exploração, mantendo para isso o preço das coisas com os menores custos, há que começar pela educação, ainda mais a das crianças. Why does the view of sharing resources have to include machines making everything? Many people LOVE handmade clothing, pottery, glassware, lovingly-tended gardens…. and lots more! I would never want to live in a place where all the homes look alike, all the gardens look alike – though I would love more wild, natural places left alone, or restored to Nature’s own diversity. I’m sure people can create a fair, resource-sharing system that has not lost its heart and soul. Certainly I want my doctors to have a fabulous computer system to ask questions and look up answers – but I want a doctor with heart who also uses his own instincts to synergistically look at my own body’s natural system and help it restore its own optimal wellness. I hope you get some artists and craftsmen interested in resource-sharing economy, so it can become more beautiful, and not just more efficient! I don’t want more free time to work on sports or art that is separate from my life – I want to make my life an art, with beauty and inspiration everywhere. And I want us all to share equitably, without war. But we will need some sort of a system of councils, where disputes can be resolved. – There will always be humans seeing things differently, and needing support and conversation to work back to more harmony. There are already/still some indigenous peoples who long ago figured out to live sustainably, beautifully, and harmoniously. We need to seek them out, and humbly ask for their wisdom, to apply to the modern world which can include sustainable technology which serves all life and a healthy Earth. I would also hope that some of the view of constructing the cities you mention, could move away from concrete (an un-sustainable resource, that does not deal well with transpiration of moisture – houses must breathe! 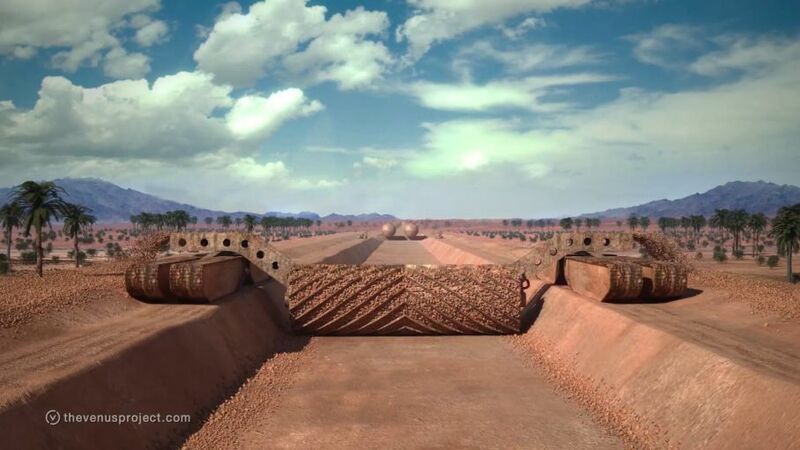 ), and instead look at ancient systems of building homes from the earth beneath them. Sustainable, natural, beautiful homes made of cob, rammed earth, straw bales, culled trees, and more (I am only beginning to learn about natural building!) – varying according to the local climate and to the aesthetics of the dwellers. Darshana Maya Greenfield, thank you so much! All of your comments are very important. And I especially thank you for remembering the indigenous peoples, many or most of whom historically lived in balance with the natural world, because they understood themselves to be a part of the natural world, and not its Separate Overlord. Yes, Venus Project people need to reach out to indigenous peoples (carefully and with greatest respect! ), to invite their participation in critiquing any and all Venus Project ideas. I have no doubt that indigenous peoples would offer other important, valid, needed ideas to TVP, that have not and could not be thought up by anyone else. The global project to help humanity evolve into Right Relationship with All of Life, needs the input of ALL peoples, including monetarily poor peoples, women, youth, elders, and all the brown and black and tan and yellow peoples of the world. All of our perspectives and insights are needed, to enable this project to be fair to and inclusive of everyone. I grew up in the country, on the land, and I know that we humans evolved on the land, NOT in cities. For that reason, I strongly express that any and all people who want to continue to or return to live on the land, have the Human Evolutionary Right to do that. It’s where and how we evolved, and we should each be able to continue or return to living on the land, if we so choose. Many of us on the land, are willing and able to grow and gather healthy foods, which we are also willing to share with others. We can continue to do this, on the land. We also find plant medicines on the land. We must protect the ecosystems within which these medicine plants grow, so that all of life will have these medicines into the future. And we on the land, accept our responsibility to reclaim injured ecosystems and restore them to health. Once we make the proper beginning, the land is very able to take it from there and restore itself. Without our help, it would take the land a longer time-frame to heal itself, but eventually it can and will. The land is also home to all the wild animals of the world, and we humans owe it to the animals, to help restore damaged ecosystems, so that animal extinctions will slow down from their current exponential pace. We have the responsibility to respect and protect the land, so that the animals who have lived there for millions of years, can continue to live their lives, as well. So thank you, again, Darshana Maya Greenfield, for expressing much of what I, too, am thinking and feeling, about how to do this transformation in a way that is beautiful, and not just functional, and so that it is inclusive of all peoples’ needs, cultural perspectives and wisdoms. I myself am descended from indigenous peoples of two continents. I give thanks to my indigenous ancestors, for their wisdom and for their strength in surviving the onslaughts of the past 500 years, so that I – and all of us – can be here, now. May we collectively find the ways in which to cooperate and evolve back into balance with the Earth, for the good of all life. That would be a very great vision indeed if people REALLY want the change or should I say the WORLD really want this change and please dont get me wrong, I have nothing against it. I mean its such a very bold vision that need to take some considerations thats why this wasnt easy for sure, for the reason it has to point out every angle of how we gonna live as far as human necessities are the main concern here. Which I think you already have this concept in your minds that hold one of a very important argument. Yes the “CONTROL” capability and sustainability for the transition itself to work. In today’s world, we are in controlled by MONEY. Why? It is because our resources must be controlled. Our workforce must be controlled. WE ourselves must be controlled. For example, the more” free” aka. distributed housing for each everyone of us that a construction company must build the more resources that going to be needed for the materials. Enough resources? Maybe yes in the first wave of production. But how about next? And who’s gonna move to build it? Construction Worker: Nah…I’ll pass. Its been my job since a long time ago. Somebody has to do that work for me. I deserve a break… oh wait, what can you offer in exchange? A meal? Clothing? Car? Housing? No thanks. Im going to get those without having my arm lifted anyway. I’ll just wait. Bank Teller: I can’t do that! Construction Companies: Oh no… we were instructed to build and distribute 7.5 billion town houses, condos, luxury buildings etc. because each one of us wants a piece of those…jesus. Restaurants: Hey you! this is not a feeding program! Im saving my stuff for myself. Clothing Companies: Shortage of materials?! Is this for real?! Old Government: We cant force them to work. They have already devalued our system afterall.. and they can get whatever they want. You carry on from now on. What I’m trying to say is these are some factors/situations which I think are not impossible to happen and we should reconsider first before going into deeper aspect of transitioning into a new system. I repeat, I have nothing against it. It is just human race survived and progressed under a control mechanism. I hope you got my point. If you want a better understanding of the control of “money” there’s a great interview doc called Abolishing Capitalism. Learn how it all “works”. Money will be obsolete one day, if enough people wake up soon enough from this sad forced existence.
. A collaborative way of thinking and living and pursuing individual growth for the betterment of all would eliminate some views you point out. This is not just a new “system” it’s a new and completely different life experience for humanity. Society now is self absorbed because they don’t need or “have ” to , or want to worry about other people’s problems because it’s an every man for himself world stage. That ideology would be abolished . For a new world, you need a new humanity..and I for one would am so ready for it. Некое пояснение к предыдущему монологу приводящему в пример исключительно те факты, что приходилось наблюдать. Проходит немного времени, и другая обезьяна пытается полакомиться бананом. Та же ледяная вода. Третья обезьяна, одурев от голода, пытается достать банан, но остальные хватают ее, не желая холодного душа. А теперь уберите одну обезьяну из клетки и замените ее новой обезьяной. Она сразу же, заметив бананы, пытается их достать. К своему ужасу, она видит злые морды остальных обезьян, атакующих ее. После третьей попытки она поняла, что достать банан ей не удастся. Теперь уберите из клетки еще одну из первоначальных пяти обезьян и запустите туда новенькую. Как только она попыталась достать банан, все обезьяны дружно атаковали ее, причем и та, которую заменили первой (да еще с энтузиазмом). И так, постепенно заменяя всех обезьян, вы придете к ситуации, когда в клетке окажутся 5 обезьян, которых водой вообще не поливали, но которые не позволят никому достать банан. Changing the ‘form’ of the money still uses “money”. Changing from metals to paper, then to plastic, now to 1’s and 0’s is all money. Money is nothing other than a way to measure labor (amount of hours and/or value of each hour). But where do you get the wood, the tools, the know-how? You are not born with them. If I am the only person with wood on my lot and I use it for shade; where do you get your wood (assuming you want to build a wood table)? You have to possess something that I consider to be “more valuable” than the shade I get from the wood you want. —->That is all that “money” is. But of course, I could “franchise” the table-building by teaching others how to and then getting a “cut” from their labor. ALL I say is that every economic system is ‘monetary’. The form of the currency/”money” changes, but it is always present. The venus project is wonderful, and i have a feeling it is a way to our future generation. 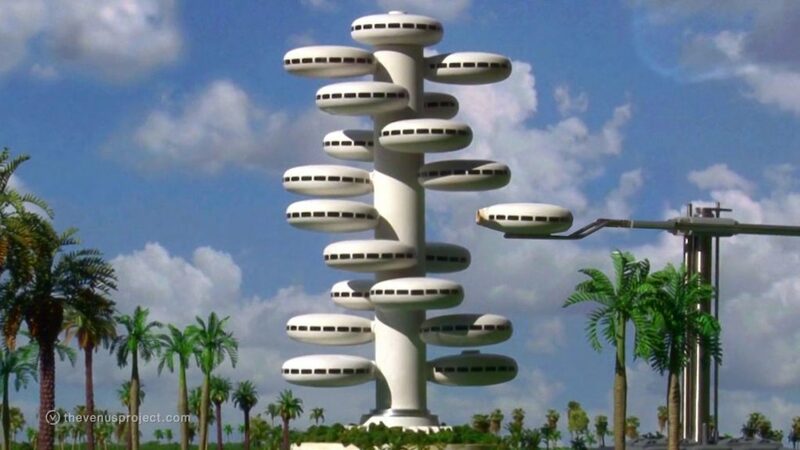 Jacque Fresco..and your group i wish you the best. I would love to visit the project. If society as we know it were to end today, most of the population would no be able to survive. Their would be mass rioting and teams of thugs go door to door taking everything of value from those who still have (mainly food) because we live in a society where people are being taught that the world owes the something and should take care of them. When children grow up and don’t even know how to boil water or sew on a button, we have a problem….. I find it really funny that you ask for donations when you want the world not to use money… $200 per household to do a tour! This is the biggest joke since Scientology!